The big news for voice fans this week is the Canadian Opera Company premiere of Kaija Saariaho's L'amour de loin, which is being billed as Love From Afar. 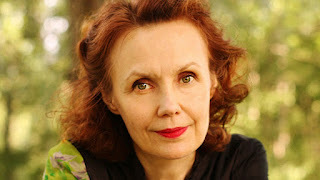 Saariaho is one of a handful of contemporary composers whose works are regularly performed, and more importantly, revived. Her musical idiom is unique in its tonal palate, with its elusive quality that is at once adventurous but also accessible. Last year, several of her chamber and vocal works were featured in the Toronto Symphony Orchestra's New Music Festival, with none other than soprano Karita Mattila interpreting a couple of the pieces. Saariaho's larger scale works, her operas, are also regularly staged. For example, both L'amour de loin and Adriana Mater received productions at the prestigious Santa Fe Opera. I was fortunate to catch L'amour de loin there in 2002 with the superb Canadian baritone Gerald Finley as Jaufre Rudel, Dawn Upshaw as Clemence, and Monica Groop as The Pilgrim. I wouldn't say it was an easy work upon first hearing, but I found that the more I delved into it, the more rewarding it became. That production, available on DVD, is visually striking but also quite static. What we are getting at the COC is the more recent production from Vlaamse Opera in Antwerp. (Quite incidentally, the Finley role was taken by another Canadian, Phillip Addis) In Toronto, we'll have the great Russell Braun - the terrific Orestes from last Fall's Iphigenie - as Jaufre Rudel, Erin Wall as Clemence and Krisztina Szabo as The Pilgrim. COC Music Director Johannes Debus, whose work includes a lot of contemporary music, is the conductor. If you are at all interested in new music, this is not to be missed. It opens on Thursday, Feb 2 at 7:30 pm, and repeated Saturday Feb. 4 at 4:30 p.m. If you are curious about Saariaho's music, the COC two noon hour concerts of her works. On Jan. 31 is a Chamber and Vocal concert with Canadian soprano Carla Huhtanen, and on Feb. 2 is From the Grammar of Dreams: Vocal Music of Kaija Saariaho. Soloists are members of the COC Ensemble Studio.